Rare Disease Day Wales has become an important highlight of my calendar and this year’s event was no exception. 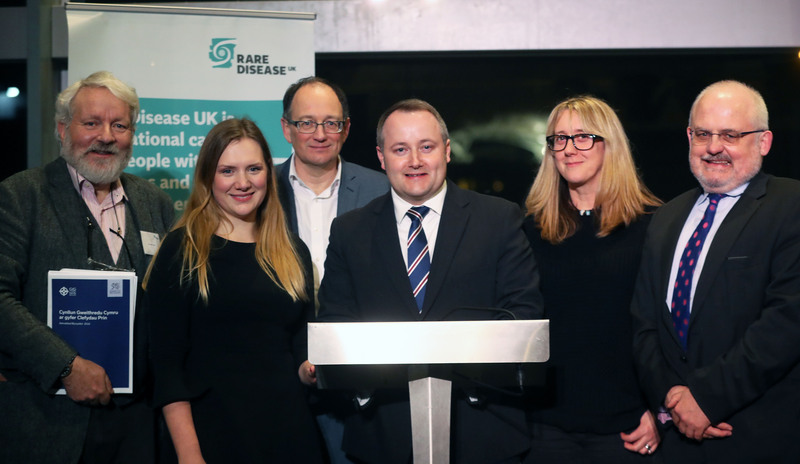 In February each year, Rare Disease UK organises receptions across Britain to highlight the importance of Rare Diseases to health professionals, politicians and patients alike. Rare Disease Day is officially celebrated on 29 February (a rare day), and 28 February when it isn’t a leap year. I started attending the Welsh reception on behalf of the Primary Ciliary Dyskinesia (PCD) Family Support Group in 2015 and found it a great opportunity to meet other rare disease patients and also to speak to medical professionals about PCD, many of whom have never heard of it. 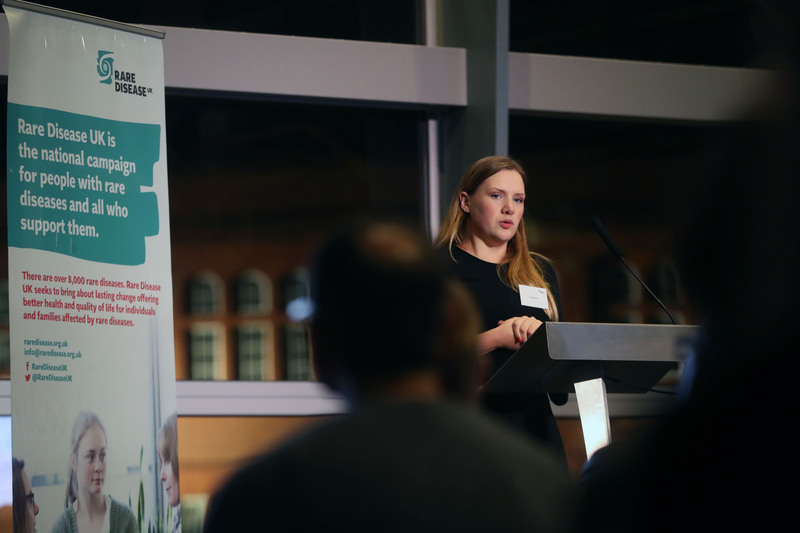 This year however, I was lucky enough to be invited by Rare Disease UK to talk about my diagnosis of PCD as one of two patient speakers at the event. Before delivering my presentation, we heard about the imminent roll out of the 100,000 Genomes Project in Wales and how it will take an even greater focus on rare diseases, having been advised by the same team in England that the cancer research side of the project was not as successful in terms of delivering results as the rare disease side. We also heard from the mother of two children with Fragile X syndrome, which is another very rare disease. I then went over the symptoms of PCD, which generated quite a few raised eyebrows in the audience. I think sometimes people are surprised when I describe my symptoms of a wet, productive cough, hearing loss and severe sinus disease and how I also have bronchiectasis, reflux and chronic pain. To the untrained eye, I am an especially healthy looking human. This became even more surprising to many when I showed off some of my ‘mug shots’ and horror photos (they’re not that bad). When I was younger, it never crossed my mind to document any treatment or intervention with my PCD. Nowadays however, I recognise the importance of it, not just for raising awareness but also for use as evidence, for example in certain benefit applications. I spoke about my own route to diagnosis. Though I was born with pneumonia (as many of us PCDers are), nobody ever questioned that I had an underlying condition. When I was four, my mum pushed for me to see a peadiatrician, as I was constantly catching infections and had an incessant runny nose. We had just moved to Peterborough from rural West Wales and after seeing the local consultant, I was sent to Leicester for diagnostic testing by Dr O’Callaghan’s team. It came back positive for PCD and from thereon in, I was having physio three times a day. We moved back to Wales when I was seven and my childhood was fairly healthy. I caught infections a couple of times a year, but my mum was very proactive in making sure I was having extra physio and keeping up with my oral antibiotics. It wasn’t until I was about fifteen that I started getting trickier infections and began having intravenous antibiotics, firstly once a year, and at its worst nine weeks per year. The theme of Rare Disease Day this year is ‘research brings hope to people with rare diseases’. This is an important theme and it led me to discuss my experience of being under non-specialist hospitals compared to specialist. Whilst growing up in Wales, I did not have access to specialist care, particularly once I moved into adult care. In 2010 I was starting university at Cambridge and I was referred to Papworth Hospital. It was here that a huge overhaul of my routine took place. I was given different medication, including more specialised antibiotics, more frequent tests and consultations, and new physiotherapy techniques. I found myself having intravenous medication every few months, which is quite stressful when you’ve moved into a new environment and are trying to grapple with huge workloads and making new friends. However, despite the increase in intervention, I am extremely grateful to have received specialist care, as it led to the identification of issues that had previously gone undetected. One of these was that the middle lobe of my left lung (I have situs inversus) was completely collapsed from bronchiectasis, and this was thought to be giving me some pretty bad infections. It was increased monitoring of my condition that led to better intervention and then better quality of life. In my case, instead of plying me with unnecessary amounts of antibiotics, I had that lobe removed, which had a stabilising effect on my condition. From left to right: Alastair Kent OBE (Chair of Rare Disease UK, Director of Genetic Alliance UK), Lucy Dixon (PCD Family Support Group), Professor Julian Sampson (Director of Institute of Medical Genetics, Cardiff University), Darren Millar AM (Shadow Secretary for Education & Children), Claire Hawkins (Parent of two children affected by Fragile X Syndrome), Dr Graham Shortland (Medical Director, Cardiff & Vale UHB). Having, I’m sure, thoroughly depressed several members of the audience, I reminded them that good management of PCD accompanied by specialist advice, allows patients to lead relatively normal lives. I showed them a time lapse video of my treatments (sinus rinses, nebulisers, physio, pills… you know the drill) and then some photos of my happier achievements, that I owe to having good health: getting my first job, travelling around Canada, and going to university. Lucy Dixon is a Higher Education Policy Advisor from Newcastle Emlyn in Carmarthenshire. Lucy has primary ciliary dyskinesia (PCD), a rare genetic disorder. She is among the 50% of people who have PCD to also have Kartagener Syndrome. Lucy has represented the PCD Family Support Group at Rare Disease Day in Wales since 2015. She has recently joined the charity’s committee, where she is working to help raise awareness of PCD among medical specialists as well as the general public. This blog was originally posted on the PCD Family Support Group website.